(Central Islip, N.Y., Jan. 31, 2019) – The Long Island Ducks today announced the dates of the team’s annual Kids Baseball Clinics, presented by Stop & Shop, at Bethpage Ballpark. Children ages seven to 14 are invited to participate, and registration forms are now available by CLICKING HERE. Those interested can also call (631) 940-3825 ext. 102 to sign up. 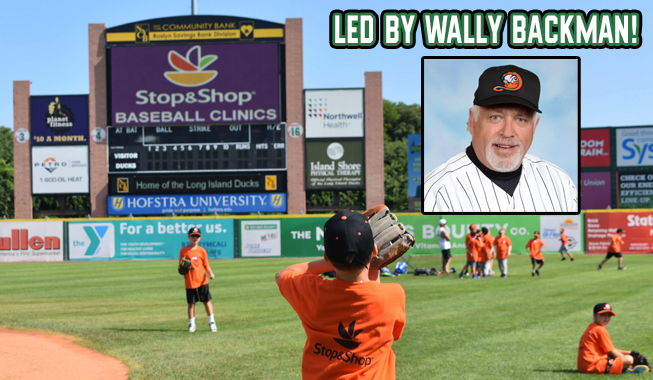 Both sessions of the clinics will be highlighted by instruction from Long Island Ducks players and coaching staff, which currently includes former Major Leaguers Wally Backman and Ed Lynch. Each day of the clinic will last from 9:00 a.m. to 12:30 p.m., and children are expected to arrive no later than 8:45. Kids should bring their own glove and bat each day and be ready to play, rain or shine. As an added benefit, those signing up for both sessions of this year’s clinics will receive a free membership to the Long Island Ducks Kids Club, presented by Bethpage Federal Credit Union (a $25 value).